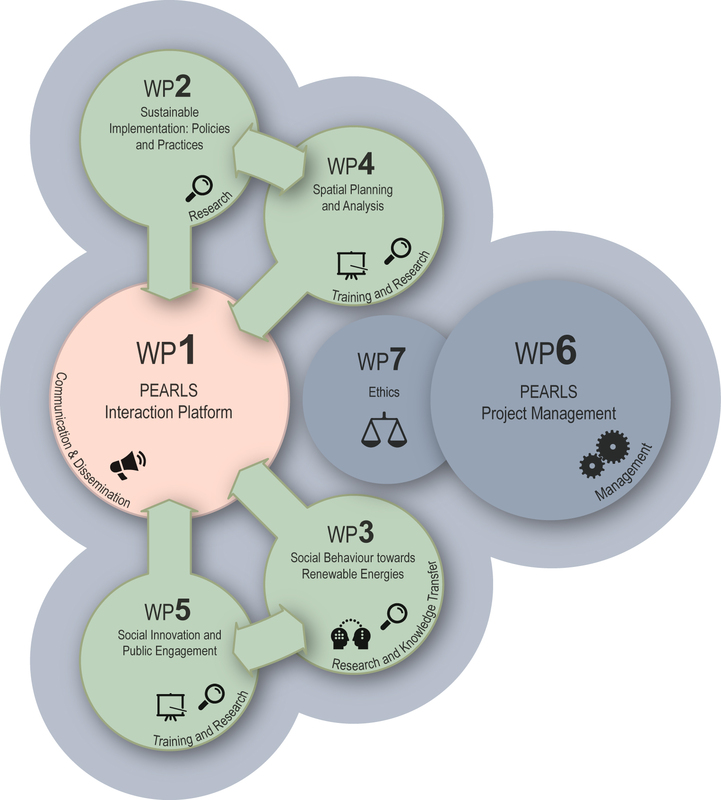 This Work Package includes research and activities and support for the dissemination of the PEARLS project. Its core objective is to facilitate a better understanding of legal frameworks and daily practice in the implementation of renewable energy landscapes. Legal frameworks include energy policy, land use planning and landscape practice regulations. These will be analysed through an exchange of staff among participating organisations on conjunction with said organisations’ cooperation. Secondment periods will enable contact with expert personnel and renewable energy landscape beneficiaries. Exchanges will allow us to go beyond the literature review in which these legal frameworks are usually set and go into territorial, landscape, cultural and natural differences in greater depth. 01. To examine and compare national energy policy, land use planning and landscape practice schemes. 02. To analyze environmental impact assessment procedures to enable the inclusion of natural and cultural aspects. Constructing a return for policy makers. 03. To research and develop tools to increase public participation in energy policy and renewable energy landscape implementation practices. Research Reports (RR) from participating countries relating to their national contexts for the construction of comparative energy policy, land use planning and landscape practice schemes. A common scheme will be established by the WP Leader for the reports. This enables references to legal documents, directives, strategies and programmes. Special importance will be given to identifying REL as specific concept in policies and practices. Interviews with national/regional policy makers and technicians to obtain direct information about the public participation system in renewable energies implementation. This task will provide information about the assessment and effectiveness of the incentive mechanism for public participation in projects. This final task will consist of three types of outputs: a) to analyse environmental impact assessment procedures to enable the inclusion of natural and cultural aspects; b) to construct a return mechanism for policy makers; and c) fieldwork on real EIA specific cases. All these outputs will be analysed to provide emerging empirical knowledge as part of a) two co-authored papers on energy policy and REL spatial planning and b) a Research Seminar (RS) that will be held at the University of Seville.